When Northgate locals, Ian and Madeline decided to try their hands at wood-working, they had no idea it would turn into a successful side business. After creating their first wooden chopping board, they had a lot of interest from friends, neighbours and the local community. 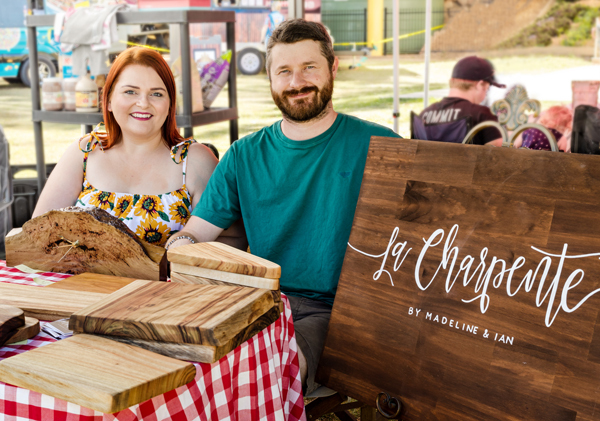 Recognising the demand for their unique products, Ian and Madeline started La Charpente, specialising in handcrafted wooden homewares. They have expanded from chopping boards to a wide variety of wooden products, including grazing planks, serving paddles, cheese boards, pizza paddles, coffee and dining tables and even candle holders. Ian and Madeline enjoy taking custom orders and working with clients to create beautiful pieces for their home or business.